My sister gave this shirt to me when she cleaned out her closet. I loved the color, but I went running in it and the collar was just too tight, I hated it. So I gave it back to my sister... then she stayed at my house recently and after she left I realized she left the t-shirt here. Now, I am assuming she left it because she didn't want it either, I hope she didn't just forget it because I turned it in to a shirt for Elly. 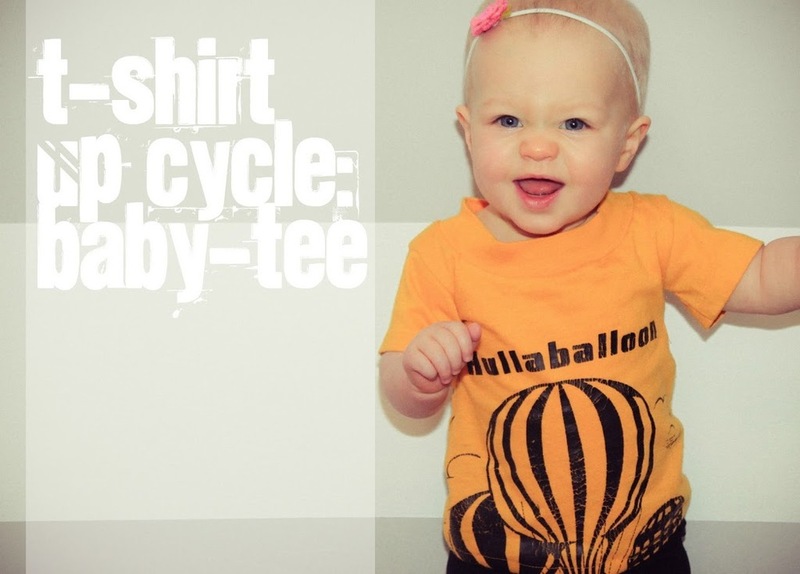 Normally, I wouldn't take the effort to make a t-shirt because you can buy them pretty cheap, but I haven't really seen a lot of t-shirts like this for babies, and I think it's cute. first: I used one of her other shirts as a pattern, but added about a 1/4 inch all around for seam allowance. second: Cut out the pieces. Now, because the collar was already tight, I didn't touch it. But normally, you may have to cut the collar, I would do this at the shoulder seam, just rip the current seam and then cut about 1/2 inch off the top. These are the pieces you are left with. third: Turn the shirt inside out and sew the sides of the shirt, leaving room to attach the sleeve. fifth: Turn the shirt right side out and fold under the bottom of the shirt and do a top stich along the bottom. Then with the extra fabric from the t-shirt, I cut three skinny strips, braided them together and then sewed the ends together to make a circle. And you have an easy headband.